I know it’s been almost eight years since The Sopranos famously cut to black. But I just finished bingeing the entire series for a second time, and even though I was obviously familiar with the ending, I can’t stop thinking about it a day after watching it. It’s actually more interesting to watch for a second time, knowing what’s coming — instead of getting caught up in the complications of mob politics and the spate of shocking deaths that comes near the end of the series, you can look for the clues to whether … and this is your one SPOILER ALERT if you haven’t watched and somehow don’t know what happens … Tony Soprano dies in the end or not. This is the question that everyone asks series creator David Chase every time he’s interviewed, and probably an annoying number of times when he’s not being interviewed, too. It is a question that will plague Chase all the way to his own cut to black. I even wonder if he knew just what he was setting himself up for when he wrote that finale. Mass perceptions can be very different from authorial intent. 1. Whether Chase intended the finale to be such a subject of continuing cultural debate, on the order of “About whom was the song ‘You’re So Vain’ written?”, it is perfect for the era of TV bingeing and digital obsession. We can now treat all these shows as if they are “always” on, so we can go over and over this for as long as it pleases us. He’s smart to keep giving ambiguous answers to the question. What fun would it be otherwise? One of the reasons the Lost finale was so disappointing is that its definitive answer was, despite the producers’ great strains to complicate the matter, exactly what we expected and also kind-of silly. I like a good “choose your own adventure” ending, as long as it is, in fact, good. I think The Sopranos ending is good. It makes sense for a show that played with audiences’ expectations as a way to enforce its themes and was at its best when showing restraint. It could get overly obvious and proud of itself at times, especially toward the end — gosh, did you want to say something about America and the war in Iraq with those nine million shots of flags and A.J.’s constant speechifying about George Bush? A cut to black at what I believe really was the moment of truth is genius. 2. Yeah, I totally think Tony Soprano is dead. I could go on and on about this, but a lot of people have already taken great pains to do this all over the Internet. (If you’re feeling ambitious, comb through this 10,000-word comprehensive analysis of every sign that Tony is dead. I did read the whole thing, and while some of it is repetitive, I enjoyed all of it.) What I will add is that it seems so obvious to me that I get a little mad that so many people think differently. I cannot conceive of a way this show and all of the symbolism of the final season make any sense if he just goes on living. The three ducks (a series-long symbol for his family) with the bell sounds flying away at the lake, coupled with the bells that accompany the family members’ entrances to the diner in the final scene? The lingering on the idea that you “never hear it coming” when you’re killed? All the references to assassinated leaders? The way the fates aligned to make the hit work? (Carmela abandoning plans to make manicotti for dinner to instead go out; Meadow struggling to parallel park and thus leaving the space to her father’s back right open for a clean shot; the very real possibility that the presumed gunman in the Members Only jacket followed A.J. to the location.) The cut, not fade, to black? Right in the middle of the chorus of “Don’t Stop Believing”? I know, I know, everybody loves that theory about how the final scene really shows that Tony will always be looking over his shoulder or whatever. That sounds like a nice rationalization for a nation that wants its favorite antihero to live, and is maybe hoping for a film version at the time James Gandolfini was still alive. I subscribed to that theory at the time it aired. I realize now that I was too distracted by thinking my cable cut out to think logically about what I’d just watched. I also know that Chase supposedly told this writer for Vox that Tony didn’t die. Whatever he said, I don’t believe it was as simple an answer as that. Chase released a statement after the piece ran that said as much. And while I don’t like to cast aspersions on other reporters’ work when I have no reason to, I also know these discussions can be complicated to convey in simple quotes. Besides which, I like Chase’s original answer; that is, the finale he wrote and directed and ended with a black, silent screen. ‘Lost’ lost me early on, right about the time the polar bear arrived, so I never had to suffer the sturm und drang of the series or the much maligned finale. 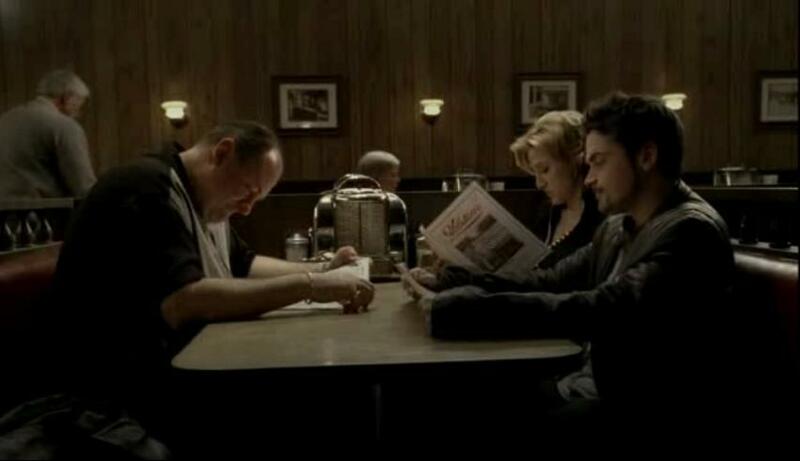 But I may be in the minority of ‘Sopranos’ viewers who was satisfied with, even loved, the finale’s ending the second after it abruptly cut to black. It absolutely stands the test of time, and I like to think Chase thought of it that way. Then again, nothing may ever satisfy me as much as Dr. Melfi’s unexpected and almost comedic firing of Tony as her patient and Meadow’s baffling, not-very New Jersey-like, inability to parallel park.